0 Comments Posted by Greystone Pet Hospital in Education on Wednesday, October 23rd, 2013. (CNN) —If you feed your pet a jerky treat and it gets sick or dies, the Food and Drug Administration wants to hear from you. The agency says it has reports of more than 3,600 dogs and 10 cats that got sick after eating jerky pet treats over the past six years and 580 of those pets have died. The FDA isn’t naming any particular brand, but says the animals mostly ate a chicken or duck jerky treat or a jerky-wrapped treat. The FDA has already tested 1,200 samples without discovering the exact cause of any illnesses. Symptoms include vomiting, diarrhea, a lack of appetite and sluggishness. 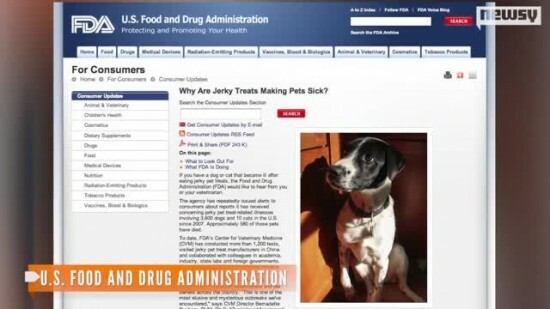 “Most of the jerky treats implicated have been made in China,” the FDA said on its website. If a pet gets sick after eating such treats, the FDA wants owners to keep the leftover treats for 60 days in case it wants a sample, and veterinarians should report any jerky treat-related cases. “This is one of the most elusive and mysterious outbreaks we’ve encountered,” said Bernadette Dunham, director of the FDA’s Center for Veterinary Medicine. The FDA is not recommending that owners stop feeding the treats to their pets, but they should watch their pets closely if they continue to give them jerky treats. The agency says dogs and cats can do without treats, since they should not be part of an animal’s balanced diet. this article was not written by Greystone Pet Hospital, it is sourced to CNN.com and is to be used for precautionary and educational purposes.